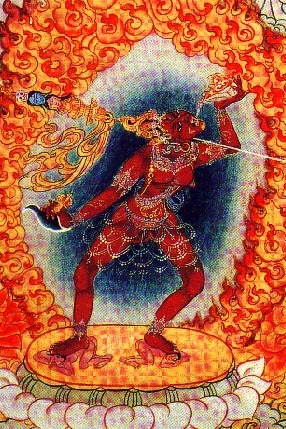 The Vajrayogini appears as the Mexican death goddess La Muerta. She is a skeleton in a red satin dress with red flowers in her hair. She dances in the burning ground with vultures and wild dogs to the sounds of clinking human bones and of spirits rushing through the air. The yogini is Queen of the Dead and the bardo of death is her territory. Do not fear the land of the dead. It is a world like any other. It just has a different aesthetic. While the process of dying may be painful, as birth is painful, the state of the dead is generally not one of pain. The hell worlds have pain, but they are a very small region of the world of the dead in spite of the fascination of many religions with these hell worlds. Most death worlds are places where ancestors live without the survival necessities of the physical body. They live out old habit patterns until eventually they open their eyes and realize that they neither eat nor sleep. That is when rebirth happens. There is no single bardo or intermediary realm of the dead. There are millions of after death worlds, along with millions of different worlds of rebirth. The six worlds described in Tibetan Buddhism are just a simplification for novices. Instead of going to the hells, most people travel through worlds of memory which repeat until they are understood. Rebirth is not a collection of ethical stories about rewards and punishments. The process is about the soul learning to gradually leave the instincts and passions behind, and grow spiritually based on increasing sympathy and appreciation of the complexities of life. Paths like Dzogchen and Zen claim enlightenment now through the practice of emptiness without learning about the intermediate worlds such as these bardo worlds or about the complexities of karma. They claim a shortcut to liberation by struggling to empty the mind through meditation. They rarely work. They and the vipassana and shamatha approaches to Buddhism say that through meditation, they can bypass karma and spiritual learning by pretending to have an empty mind. Not true. Lack of work always sells. Christians want to go straight to heaven by believing the right thing. Muslims hope to go there by doing the same ritual activities or prayers over and over. Everybody wants a shortcut. If they do make it to heaven, they will end up as workers and slaves with limited choices. If people do not develop free will and spiritual knowledge while they are alive, what makes them believe they will get them when they are dead? Workers and devotees of God while alive will continue their servitude after death.